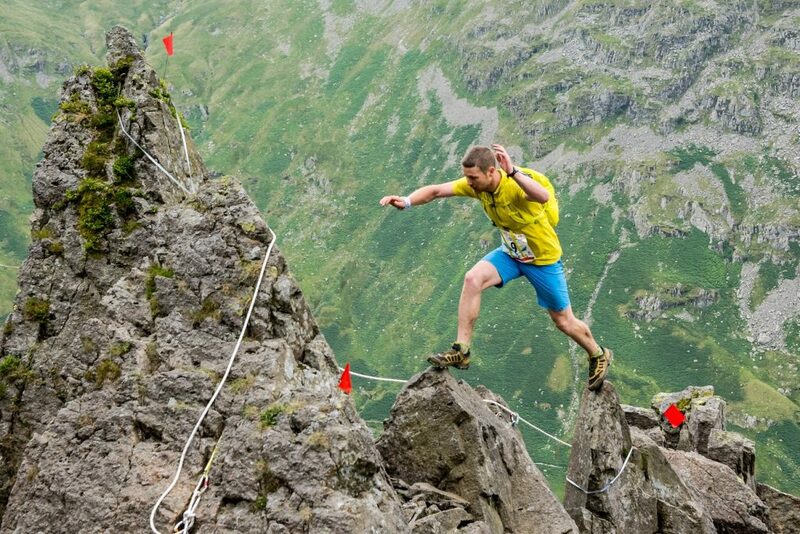 Back at the beginning of June I was asked by headline sponsors, Salewa, to report on the race and thoroughly test some of their mountain running kit. 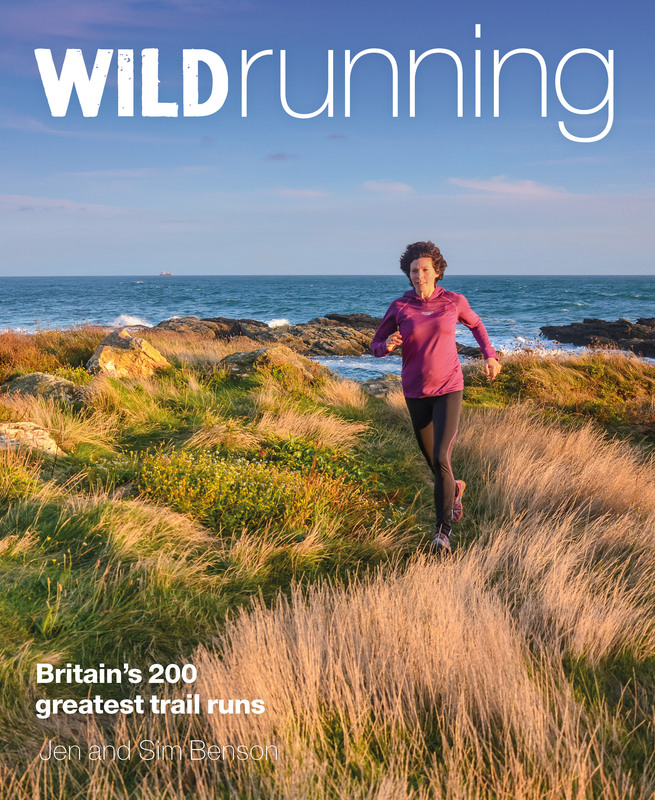 My running was going well but I certainly wasn’t training for a mountain ultra, so it was with a lot of excitement and a little apprehension that I agreed. I had plenty of miles in my legs but not many recent ones in the mountains – and not much time to do any specific preparation. I upped my mileage and searched out the hilliest local routes in an effort to do the race justice, but if I’m honest there’s not much in the south-west that comes close. The morning of the race heralded almost perfect weather: overcast, dry and still with a bit of atmospheric morning mist to hide the huge climb from Ambleside to Fairfield. Ideal for running without worrying to much about overheating, being blown off the mountain or having to carry a warm set of clothes. Last year’s event was held in strong winds and torrential rain: a great test of waterproofs but an additional level of epic to contend with. I was glad to be spared it and also to have the opportunity to race the full course. Starting promptly at 0700 the leaders raced off up the first climb while the rest of us settled into a rhythm of walking/crawling uphill and running the flatter and downhill sections. I’ve run several sections of the route before, but not very recently and never linked together; thankfully the excellent route marking meant that, even in the mist, navigation wasn’t an issue and we could concentrate on enjoying the terrain and scenery. Route highlights include the descent of Helvellyn by Swirral Edge, which I’d never done before; the drummer on the summit of Catsycam whose heady rhythm echoed around the mountains; the classic ascent of Striding Edge, diligently following the markers along the most precarious ridge line; the roped descent and the awesome shoe-filling scree down Eagle Crag followed by the hardest ascent of the day – literally crawling up the bleaberry-covered slopes of St Sunday Crag. Climbing the classic line up Pinnacle Ridge as part of a trail race was incredible: airy, exposed and, for many including myself, the best part of the day. Rope handrails on Eagle Crag and Pinnacle Ridge added a European via-ferrata type feel to the race and some much-needed assurance on the steep descent of Eagle Crag. We were well looked after at the aid station in Patterdale by friendly marshalls and Team Nutrition who provided electrolyte drinks and some great additive-free snacks to supplement the snacks available at aid stations along the route. 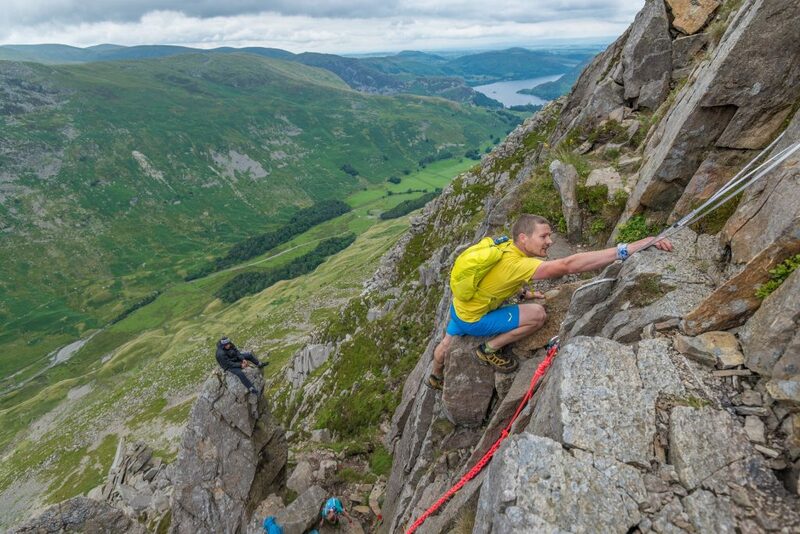 The Lakes Sky Ultra is a race of two halves: technical terrain and almost two-thirds of the ascent in the first half followed by faster running on better trails in the second. From the half-way point at Patterdale, a long steady climb took us over The Knott towards High Street before cruelly dropping us down past Blea Water to Haweswater; the beautiful scenery almost warranted the descent! By this point I was finding it hard going, especially the descents, and I teamed up with a couple of other lads and we ran together from Haweswater to the finish. The camaraderie experienced on longer races is one of the best parts of the sport and I’m sure I finished faster due to the support of other runners. The running from Haweswater to the final checkpoint at Kirkstone would have been brilliant if I’d had anything left in my legs. The final excitement came in the form of two “King of the Mountains” stages sponsored by trekking pole company, Leki. An uphill race, scrambling up Red Screes, was won by Thomas Paris and a fast 5km descent back to Ambleside was won by Donald Campbell, who also finished first overall in an impressive 07:30:40, a new course record. Sarah Ridgway finished first female and 9th overall in 08:38:46, smashing her own course record from last year. For me, the finish was an emotional relief after a tough day’s racing. A comfortable seat and a hot meal was the perfect remedy and we sat and cheered the other finishers in. The LSU cow bell was better than any medal – I’ll be taking it out when I’m next supporting a race and making loads of noise! A huge thank you to Charlie Sproson of www.mountainrun.co.uk who also organise the Keswick Mountain festival races and his amazing team of marshalls who worked tirelessly over the whole weekend: the route was awesome and you were brilliant! The photographers on the course worked hard and managed to get into several amazing places to capture some great images for everyone involved, thank you to Paul Wildman Mitchell and Steve Ashworth of www.lakedistrictimages.com for the use of their images. Thank you as well to race sponsor Salewa who supplied me with some great kit. I’ve reviewed the Salewa Lite Train shoes (great low profile lightweight mountain running shoes) and Pedroc Alpha jacket (Lightweight, packable and windproof insulation piece using Polartec Alpha insulation) before and I still really rate them so I was pleased to have an excuse to test some of Salewa’s other kit. A common piece of advice is never to try something new on race day, especially shoes and bags – I got my shoes less than a week before the race and the bag at the safety briefing the evening before! Fortunately they felt good so I went with them and didn’t have any problems. 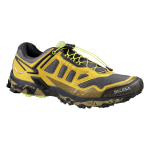 Salewa Ultra Train shoes £120: Light and cushioned, I tried these for just 5 miles before the race and they performed excellently. No blisters and the Michelin rubber is especially good on rock. They offered a bit more protection than the Lite Trains. I did find the grip slightly lacking on steep grass but they aren’t designed as a fell shoe and they’re great on rock and gravelled trail. Salewa Pedroc Shorts £55: Awesome cut and colours make these great everyday shorts as well as running shorts. Made of a stretchy soft-shell fabric they are tough and wind-resistant which works very well in the mountains. They’re also Bluesign-approved and Salewa are members of the Fair Wear Foundation which makes me even happier to endorse them. 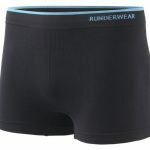 I wore these with a pair of Runderwear Boxers (you can read our full review of these here) which are also highly recommended and provided a completly chafe-free 11.5 hours. 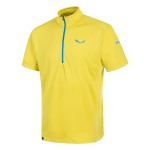 Salewa Pedroc Training Tee £55: A comfortable, good looking, bluesign-approved baselayer tee with a quarter zip to aid ventilation. I was happy in this all day, warm enough in the morning but cool enough later on with the zip undone and no chaffing. The tee uses Polygiene anti odour control so it would also be great to take on a multi day adventure. Salewa Lite Train 14 bag: Not available until spring 2017 (I’ll add a link when it becomes available) and brand new to me on race day but thankfully very comfortable. I especially liked the twin shoulder straps which managed to comfortably distribute the weight but offered a lot of ventilation. The bag also has a sternum strap rather than a traditional waist strap which – combined with an internal compression system – made it very comfortable stable. In all honesty, the bag was bigger and therefore heavier than I needed – it would be great to see a 8-10 litre bag in the same design in the range and a couple of pockets on the front would also be nice. It carried very well though and didn’t rub at all. 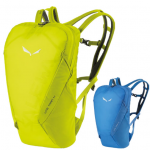 It’s made from bluesign-approved fabrics which makes it one of the most ethically produced running bags on the market. 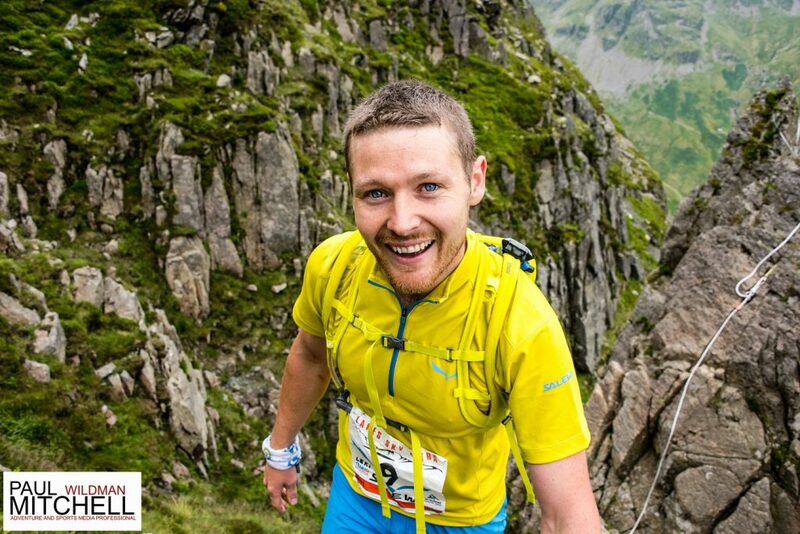 Overall I had an amazing experience and I would hugely recommend the Lakes Sky Ultra to anyone who wants a proper mountain running challenge. It’s left me a bit battered but really excited about running and racing in the mountains. I feel I learnt a lot and I’ll be better prepared for my next mountain ultra; I can’t wait!